I’ve been watching a lot of Star Trek lately. A LOT of Star Trek. Ever since Netflix secured the rights to stream the whole enchilada, I’ve been (re)enjoying the voyages of the starships Enterprise, Enterprise, Voyager, and Enterprise (and the Defiant). One of the things I’ve noticed on my return trip through the Star Trek universe is that there’s a lot of repetition: outpost in trouble, crackpot scientist endangers Federation with supposedly harmless but deadly invention, misunderstood crew member learns how to be more human, Captain Kirk flirts with alien beauty, vortex in the space-time continuum makes the crew fight themselves, rigid monoculture adheres to ancient ways despite imminent annihilation… and maybe five other plots, tops. And yet, I can’t get enough. I’ve seen TOS five times through, at least, and repeat viewings of episodes like “Yesterday’s Enterprise,” “Balance of Terror,” and “Disaster” never fail to entertain even though I know how they end. Hell, most episodes end pretty predictably even if you’re watching them for the first time. As I woke from my Star Trek induced stupor to write this blog post, I realized that the repetition didn’t matter as long as the stories were good and the characters engaged in their universe. Give me the stock shot of the Enterprise circling a fuzzy blue-green-red ball again and again, and I’ll happily pretend it really is a new world I’ve never seen before. Bumpy-headed aliens? As long as the ridges on their foreheads are different, it’s enough for me. Is there hope in so much repetition? And what do my obsessive Trek-watching habits have to do with today’s Inkpunks post? No one wants to be a copy-cat, of course, but there’s a big difference between feeling compelled to write a certain story because it speaks to you, and just trying to ride a market trend like zombies or dragons. Write what speaks to you, no matter what — that’s always the best place to start writing. There are a lot of time travel stories in Star Trek, but the common theme to most of them is take some established canon and examine it from a different perspective: The Federation is evil. Jean-Luc Picard never amounted to much. What if the Federation and the Klingon Empire were still at war? These stories are about playing “What if?,” about breaking the rules in a universe someone else established. All writers play this game. We’re often compelled to emulate the stories that inspired us, to twist them to new perspectives. Unlike Star Trek, we don’t have to set everything back as it was by the end, but we do bear some responsibility to recognize what’s gone on before (and I’ve discussed that, too.) Don’t be afraid to revisit stories you think have already been told. So about those plots. Aristotle or someone equally wise said there are only nine, or twenty, or thirty-six, or a hundred plots or whatever. Every aspiring novelist and screenwriter has probably despaired of ever being original after their teacher wrote that list on the board. There are enough Star Trek episodes to blow through almost any number I could pick out of the air in any case. So how do they keep us coming back week after week (or hour after hour these days) to the same old stories? When the crew of the Enterprise shows up to assist at an OUTPOST WHERE THINGS HAVE GONE WRONG, we have to wonder, “Why do these scientists keep getting themselves into trouble? Doesn’t someone check the Federation records before they try something stupid again?” Usually, they don’t. But beyond some initial eye-rolling, the audience usually just goes along for the ride, because they want to see what Kirk, or Riker, or Janeway is going to do this time. Will Worf embrace his Klingon heritage and snap the arrogant monoculture ambassador in half? Will Sisko ever catch a break? The stories in Star Trek don’t always cover new ground in terms of bare plot, but every revelation about the characters, every tiny epiphany they experience tells us more about them. Because, really, stories are our way of explaining the way we see the world to each other, to ourselves. In waking life, we’re only allowed to have one point-of-view, though. Any chance we get to see through the eyes of another just might illuminate an old story in a new way. As a reader, I’m drawn in by the voices, the personalities, and the unique perspectives of the characters who are experiencing that story. Even if I’ve read the same kind of thing before, it can feel completely new if I believe in the characters. When you’re writing your own stories, little details add up to big differences. How many stories about post-apocalyptic scavengers have you read? This is one of my favorite genres, in fact, and in all the stories I’ve read and loved, it’s the nitty-gritty details and little surprises that bring me back for more, even if the threats remain the same. Zombies, plagues, mutants, nuclear war, killer asteroids. One way or another, BIG THINGS have happened and the world has ended. But it’s the little details of your post-apocalyptic story that make it stand out from the pack. Where do your characters get their food? Is radiation a problem? Extreme temperature? Zombies (and are they fast ones or slow ones)? Star Trek goes to a million planets and finds the same mess over and over again. Yet the details of the disaster always change. Yes, and no. 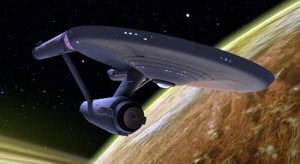 It’s true that as a serial, syndicated format for television (and even-numbered movies), Star Trek is a great vehicle for exploring big issues and broad characters. Film & TV writers, especially on commercially successful projects, have to work in shorthand. They don’t always have the time or budget or network patience for subtlety. You do. What I hope is that you can silence that little pessimistic voice in your head that says that there are no original stories left. That never stopped Star Trek. Great, great post, Andy! I think it’s easy to get angsty about writing, and particularly things like “originality,” and we can sometimes forget to just write. Even if you give the same prompt or scenario to five writers, they will write five different stories. We all have our own voices and our own stories to tell. Andy, thanks for another great post! And you are so right–originality is something we all aspire to, that we all struggle with. One of the ways that I deal with this dilemma is to consider that writers and audiences experience writing in conversation with each other, and with the audience. I think I always want to contribute something interesting to the conversation. Even if the plots seem similar, some of us disguise it best with compelling characters (as you noted), others with memorable idea stories, others with exquisite settings. And there are many experiences of originality we can’t control. I remember how cool the LotR was when I encountered it as an 11-year-old. Everything else seemed like a copy. But I’ve talked to readers who found Tolkien boring because they encountered Robert Jordan or George R.R. Martin first. Thank you for giving us all some hope. I’m glad to share the hope, John, thanks. I think a lot of beginning writers (yours truly included) are sometimes afraid that they don’t have anything interesting to say. Glad you liked it, Morgue, thanks! Great post, Andy. Definitely going to forward this link to my writing group. I find that I’m often writing a story I didn’t know was already done by someone else. When I first started writing, that elicited a note of despair that often resulted in abandoning the story. I’d like to think that now I just think, “Yeah, but my take is different because…” and then use that to propel the story to new heights. Good post. I used to worry constantly, too, trying to make sure every idea I had was original. Then I came to find out it’s almost impossible to find an idea /someone/ hasn’t thought of. And won an award for. So now I ignore worries of being cliche’, and just write. All I can do is hope I’ve given it enough of my own voice and that my own subconscious has spun it around enough to give editors and avid readers something original anyway. There is sometimes a usefulness to putting spins on the familiar. Now, a diet that is NOTHING but remakes and reboots and reinterpretations is not much fun, but there are plenty of story ideas that could use another look. Yeah, Paul – I hope my message isn’t construed too much as “never try to be original,” but I know a lot of new authors are so paralyzed by the pressure to be so, that they get in their own way.